This August 14th Social Security will celebrate its 73rd anniversary, a good time to reflect upon a program that allows us to retire after a lifetime of work and keeps millions of people out of poverty. The reality is far more optimistic. Since the early 1980s, Social Security has been taking in more in worker contributions than it has been paying out in benefits. This has resulted in a growing trust fund of more than $2 trillion. These reserves are projected to grow for another decade, and then will decline and run out in 2041. If no action is taken, benefits will have to be cut by about 25%, as they will be funded entirely from current contributions. Even if lawmakers allowed this to happen, future retirees will receive benefits that are more generous than those received by previous generations. Retiring at 65, the typical young adult born between 1980 and 1990 will receive retirement benefits valued at $188,000 in 2007 dollars, up from $181,000 for retirees born between 1960 and 1970. The bottom line is that Social Security is in good shape—we should all be so lucky at age 73. Changes to shore up the program’s financing and make it more progressive are warranted, but there is no crisis, and certainly no need to rush to dramatic reform. Note: Assumes all workers eligible to claim retirement will do so by age 65. Source: Congressional Budget Office. 2006. 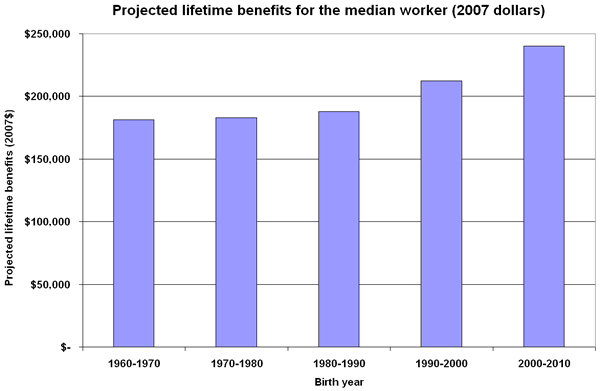 Updated Long-Term Projections for Social Security. www.cbo.gov/ftpdocs/72xx/doc7289/06-14-LongTermProjections.pdf.